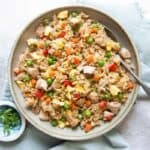 This recipe is based on my original chicken fried rice recipe that I shared on Simply Recipes. Cut the chicken into 1/2-inch pieces. Transfer the chicken to a bowl and season it with 1/2 teaspoon salt. Set the chicken aside while you prepare the other ingredients. Heat a wok (or large sauté pan) over high heat. Add 1 tablespoon of oil and swirl it around. Add the whisked eggs and scramble them quickly with a spatula. Cook the eggs for 30 seconds to 1 minute, until they’re no longer runny. Turn off the heat and transfer the eggs to a plate. Wipe down the wok or sauté pan. Add another tablespoon of oil to the wok over high heat. Add the chicken pieces and let them cook for 4 to 5 minutes, stirring occasionally. Transfer the chicken to another plate. Drizzle the last tablespoon of oil into the wok over high heat. Add the onions and cook them for about 1 minute, until they start to soften. Mix in the minced garlic and ginger and cook for 30 seconds. Add the carrots and red bell pepper and sauté for about 2 minutes. Next, add the peas, rice, five-spice powder, and white pepper. Toss the ingredients together. Use the back of a spatula to break up any large clumps of rice. Once the rice has heated through, about a few minutes, add the cooked eggs and chicken and toss everything together. Finally, add the scallions, soy sauce, and sesame oil, and stir to combine. Taste and add more salt or soy sauce if necessary. Serve the chicken fried rice immediately. *I usually thaw my frozen peas by soaking them in warm tap water for 10 to 15 minutes.